50 years ago today, Apollo 8 launched on a mission to orbit the moon for the first time. The story of this mission is one of American courage and dedication at Christmas. Space Cadet Carl One of my best childhood memories is of lying underneath our Christmas tree on the night of December 24, 1968 and seeing those ghostly black and white television images from lunar orbit, while the crew took turns reading from the Book of Genesis. After the broadcast was over, everybody in our living room just looked at each other in silence. Wow, what a moment! Glint The great thing about launch day in 1968 was, not only was it the day before Christmas week, but it was Saturday, meaning no school. It was up bright and before the rest of the family for launch coverage on CBS. 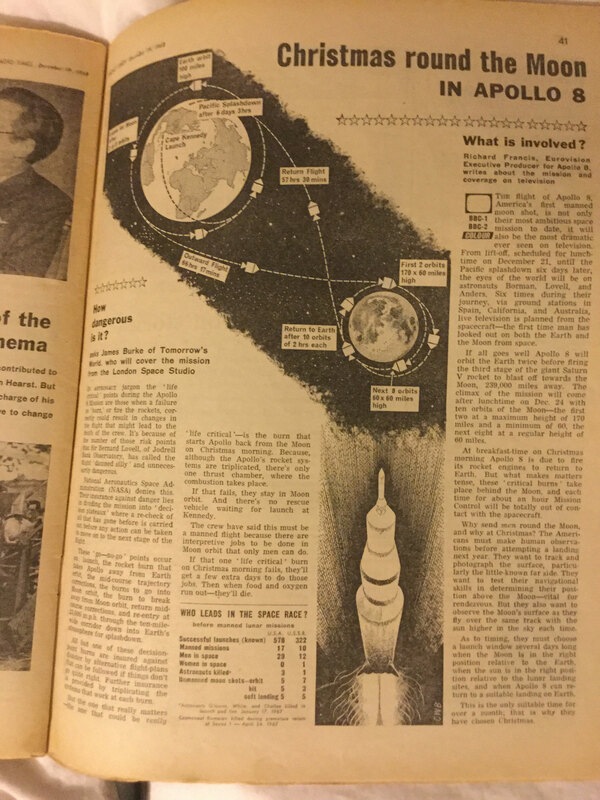 Rick Mulheirn As a child I was interested in all media coverage of the space program to date, but Apollo 8 really fired up my imagination and the compulsion to collect. BNorton In the NASA video, the NASA Administrator does not appear to know the history of his agency. While Apollo 6 had multiple problems and did not meet specific mission objectives due to the problems, I have never heard or read where anyone referred to it as a failure, nor do I recall (nor can I find in a quick scan of Apollo 6 flight history) that the service module engine failed to restart. It did not burn near mission end due to a lack of fuel because of an extra long prior burn. I am sure someone in this forum will correct me if I am wrong. Robert Pearlman I think when Bridenstine said, "In the previous mission, that single mission failed to reignite even once," he is using "failed" to describe the original Apollo 6 mission plan rather than a technical failure of the SPS engine. That said, I agree that could have been worded more precisely. BNorton I listened to the video a couple more times, and found it to have several more errors. He, the Administrator, does explicitly refer to the service module engine as failing to restart after talking about the multiple times it would be fired throughout the mission. I think you are being too kind. The Administrator (or whomever wrote his script) needed to do a much better job. Apollo 8 was a great U.S. accomplishment. Having missed watching the previous two, it was the first Saturn V launch we watched from our backyard. 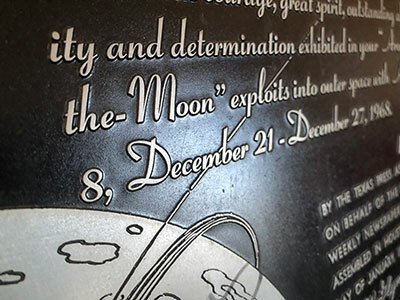 The historic year 1968 was closed out by NASA with a first-of-its-kind accomplishment: putting human beings in orbit around Earth’s Moon, a feat that also provided the people of Earth with their first-ever view of their planet from afar. So cozy up around the fire and join us to recall the events of fifty years ago which forged the path to those first footprints on the Moon. perineau Not to be too picky, but the "walkout" footage of the Apollo 8 crew was from a practice run and not the real thing! In December of 1968, the crew of Apollo 8 became the first people to leave our home planet and travel to another body in space. But as crew members Frank Borman, James Lovell, and William Anders all later recalled, the most important thing they discovered was Earth. Using photo mosaics and elevation data from Lunar Reconnaissance Orbiter (LRO), this video commemorates Apollo 8's historic flight by recreating the moment when the crew first saw and photographed the Earth rising from behind the Moon. Narrator Andrew Chaikin, author of "A Man on the Moon," sets the scene for a three-minute visualization of the view from both inside and outside the spacecraft accompanied by the onboard audio of the astronauts. perineau Half a century ago tonight... God Bless the crew of Apollo 8! For many, Christmas is for spending time close to loved ones. But in 1968, astronauts Frank Borman, Bill Anders and Jim Lovell would spend their Christmas Day further away from home than any human had ever done before. With the help of archive material, former NASA employees, author Robert Kurson and the astronauts themselves, Anna Foster remembers the Apollo 8 mission on its 50th anniversary. NavyPilot I enjoy pointing out to people that the crew of Apollo 8 also were the first humans on terrestrial record ever to fly TO EARTH (having to maneuver actively to enter its gravitational field), just as any other visitor might. Blackarrow I'm still trying to work out which is more surprising: that Apollo 8 succeeded; that no-one has been back to the Moon since Apollo ended; or that the three Apollo 8 astronauts are still with us 50 years later. 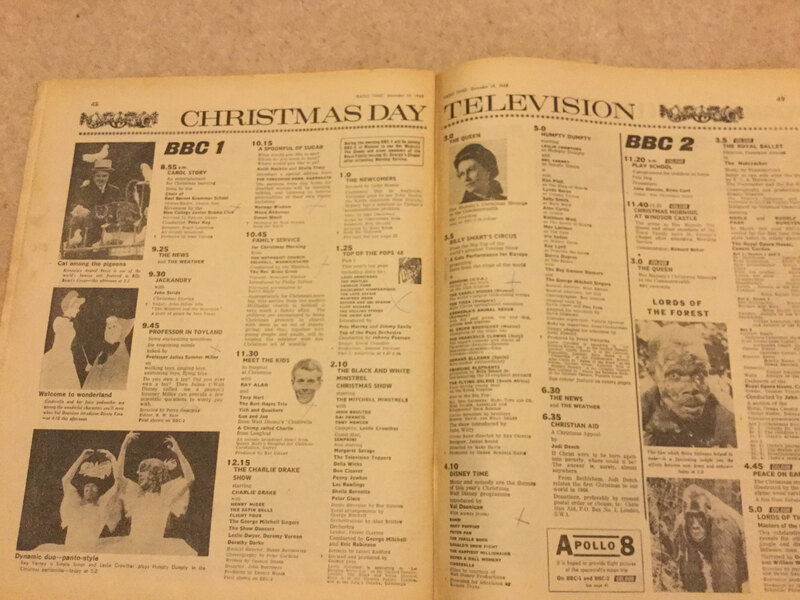 holcombeyates Thought it might be of interest to post the UK television listings for Christmas Day 1968. There are no hard scheduled times for transmissions from the moon, so I guess that it would have just interrupted scheduled programmes as and when. Also an interesting article on the technical risks that were inherent in the mission. 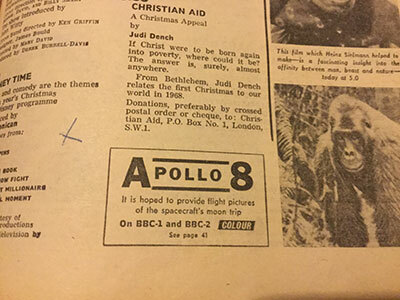 Cozmosis22 From KRTV, CBS television affiliate in Great Falls, Montana, this short segment with Frank Borman regarding the 50th anniversary of Apollo 8.
denali414 A good show about Apollo 8 on Nova last night: Apollo's Daring Mission (Season 45, Episode 18). 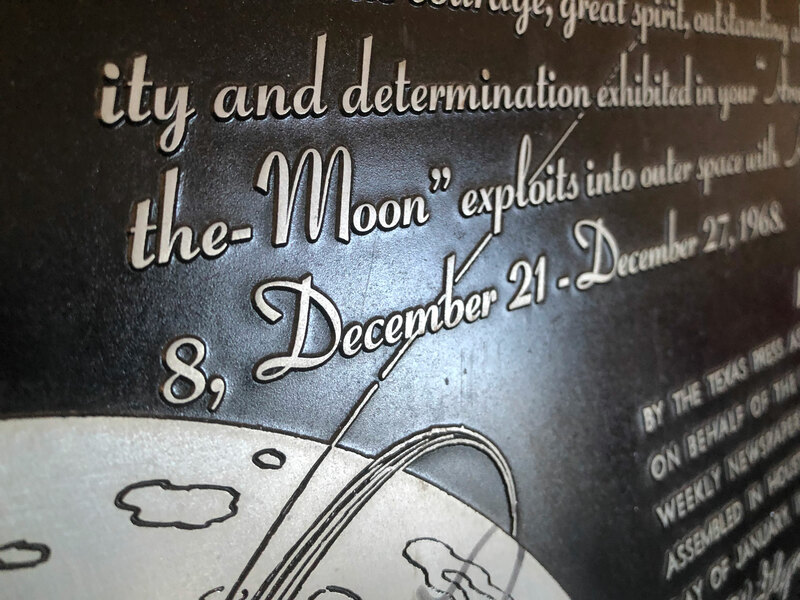 ...or that the three Apollo 8 astronauts are still with us 50 years later. ...and all three are still married to their first wife! 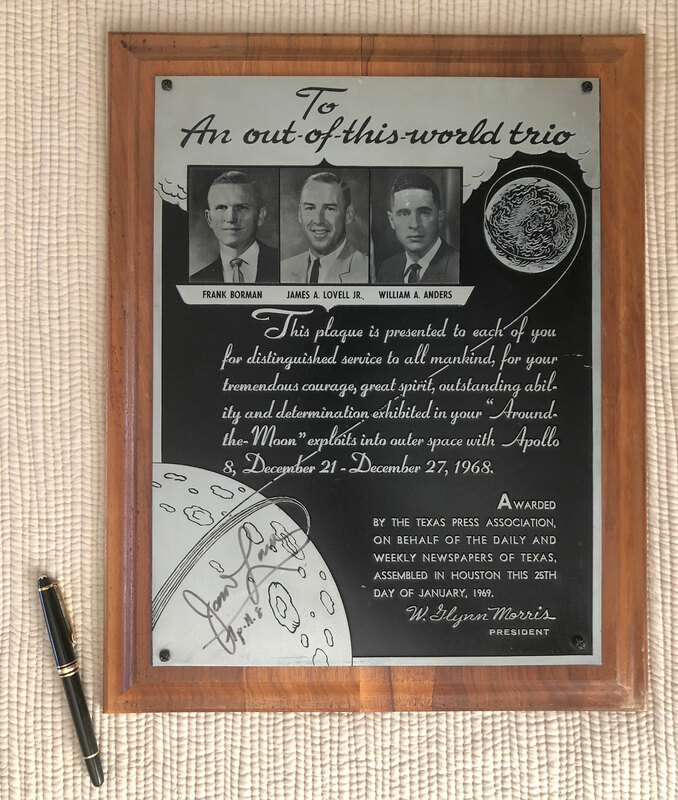 David Carey An article from the Bartlett (Texas) Tribune details an award ceremony 50 years ago on Jan. 25, 1969, where the Apollo 8 crew were honored in-absentia by the Texas Press Association. Paul Haney represented NASA for the event and presumably brought back three sizable high-relief plaques for the astronauts. Here is Jim Lovell's copy. kosmo Beautiful plaque. Apollo 8 was an incredible mission. 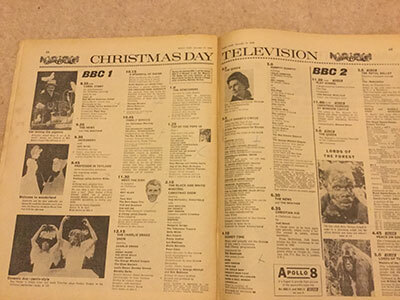 Its 50th seems to have come and gone without much notice. Robert Pearlman While not as hyped as the upcoming Apollo 11 anniversary, there were at least five galas or special events to mark Apollo 8's 50th; two books released (three, if you count a new audiobook version of an earlier title); two television specials; numerous print, TV and radio news reports about the 50th anniversary of Earthrise; and the official naming of two craters on the moon.